EDIT: Giveaway is officially over. Congratulations to Sandy Klocinski for submitting the randomly-chosen 105th entry. Please email me back within 72 hours to claim your prize. I am such a fortunate wench! Talk Like A Pirate Day, Sept. 19, marks me fifth anniversary to me soulmatey. 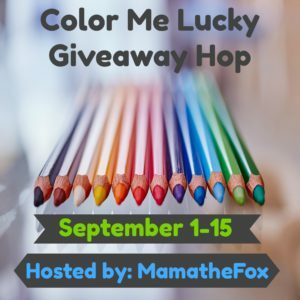 To celebrate, I sailed into the Color Me Lucky Giveaway Hop. 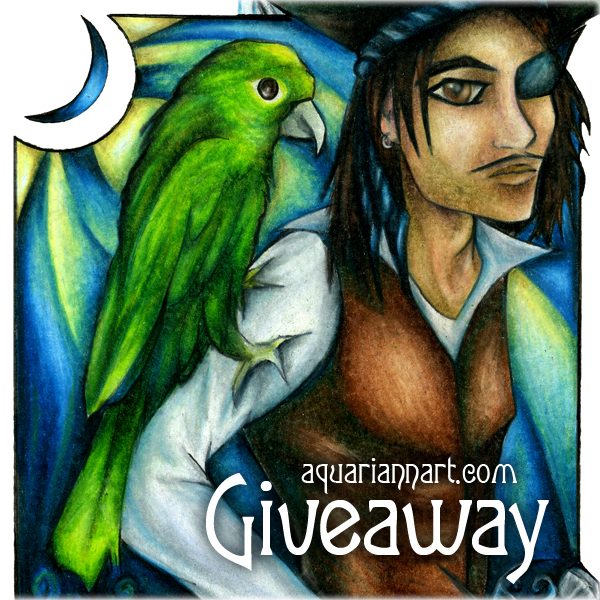 One of me hearties will win a magnet of the pirate and parrot pair above, based on my dad and his pet when I was first born. I'm also including a magnet of the proposing pirate I drew after Ogre and I got engaged. Thanks to MamatheFox for hosting! This is simple stunning , so are all of your photos , but this one called to me most of all. My fave is the Winged Wolf In Downward Dog Yoga Pose, I love wolves! I like the Royal Purple Orchids. I love the winged wolf in downward dog yoga pose! I love the warrior unicorn! White Rabbit On Way To Wonderland Art Print is my favorite. It is beautiful. My favorite is the pink Ribbon Fairy for breast cancer. My favorite is the Pink and Yellow Columbine Flower Drawing. Love the Sunflowere Rising picture. Really like the White Rabbit on the Way to Wonderland too. what a colorful vibrant photo, love it.. I like the Royal Purple Orchids picture. Thanks. I <3 the pirate and the parrot! I think my favorite would be the Golden Unicorn Warrior Art!! I like Queen Of The Night Cries In Joy. I love the Pink and Yellow Columbine Drawing. My favorite is the Queen of the Night Cries In Joy. It's a gorgeous photo and my favorite color is red. I like the Monarch Arc. My favorite is the Golden Unicorn Warrior. My wife really loves the cool White Rabbit On Way To Wonderland and the odd look in his eyes. The amazing Winged Wolf in Downward Dog Yoga Pose, my wife would enjoy having. and it would be a great gift. My lady friend likes great items, and the Orange Tiger Lily Drawing, would be just marvelous to have for all occasions. I really like good things, and the Golden Unicorn Warrior Art, would be wonderful to have in my home. The captivating Pink and Yellow Columbine Flower Drawing would be a fabulous thing for my girlfriend to have, and it would be just great. The awesome Red Gerbera Daisy Drawing, would be just right, for the day and and my wife.